Traditional elegance with a contemporary flare, makes the Houston Grey Dresser perfect for any décor style. The Houston Grey dresser features 7 spacious drawers, including a hidden jewelry drawer. Stylish framed end panels and antiqued bronze hardware accent the warm grey finish. 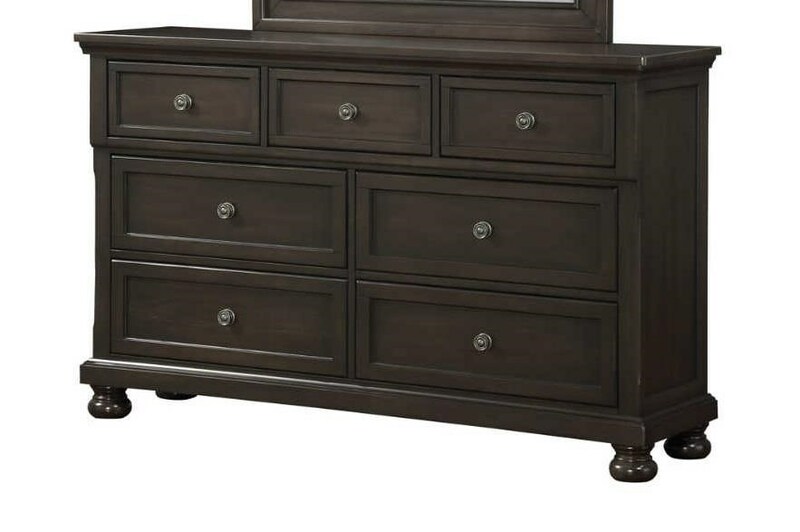 The Soriah Dresser by Avalon Furniture at Great American Home Store in the Memphis, TN, Southaven, MS area. Product availability may vary. Contact us for the most current availability on this product. Stylish yet functional, the distinctive Avalon Furniture Houston collection boasts classic lines with gentle curves. The sleigh storage bed features a tall headboard with divisions and two wide drawers on the footboard providing extra storage space. Together with the complementing stylish casegoods, the collection is finished in a warm distressed grey for the much sought deep color and rich, natural texture. The Soriah collection is a great option if you are looking for Traditional furniture in the Memphis, TN, Southaven, MS area. Browse other items in the Soriah collection from Great American Home Store in the Memphis, TN, Southaven, MS area.